Are you creative? Have you made some masterpieces lately with diapers? Enter Our Creativity With Diapers Contest And Have A Chance To Win Some Great Prizes! Have you made a diaper cake, diaper wreath, or a diaper baby? Maybe you've pushed the creative envelope by developing a new diaper work of art. Share your Masterpiece with us and we will share it with the world!! Besides giving other women great ideas, you will be eligible for winning some great products. To make your submission extra special, each diaper craft you enter will be placed on the web for you to be proud of. NOTE: We are now accepting entries for our next contest. Went to by Carol of Bluff City, TN for her VW Bug Diaper Cake. We loved creativity of the suspended airplane! She won a $75 amazon gift card. Went to Amanda from Point Comfort, TX for her Zebra Animal Cake. She won a $50 amazon gift card. Went to Amanda from Port Lavca for her Lady Bug Themed Diaper Cake and Crafts. She won a $25 amazon gift card. Went to Carrie for her Elegant Tea Party Diaper Cake. She won a $25 amazon gift card. Which went to Heather from Levittown, PA for her Little Piggy Diaper Cake. She won a $25 amazon gift card. Slyvia from Lufkin, Tx for her Little Prince Diaper Cake. She won a $25 amazon gift card. We would like to thank everyone who submitted their diaper cakes into the contest. The amount of entries made the judges final decision very, very hard. Enter more pictures into our next contest for another chance to win! Feel free to submit as many cake photos as you would like. We love step-by-step photos! Please explain detailed step-by-step instructions on how you made your cake. Let us know any helpful tips you learned making your cake, where you came up with the idea and what baby shower theme it was used with. The picture(s) sent must be a close up of the cake allowing readers to see the details. Send pictures in JPG or GIF file formats. Diaper craft contest entries will be judged based on overall creativity, detailed instructions, unique qualities and overall appearance. Pictures submitted into the contest must be original, copyright free photos taken by you, a friend, or family member. You may enter as many times as you like. Each entry must be of a different diaper cake. A description, story or comment is not required to enter the contest, but will increase your chances of winning. The winners will be notified by email and placed on the website. If the winners have not responded to the notification within 7 days, they will forfeit their prize and new winners will be selected. Contest is open to contestants who are 18 years of age and older. 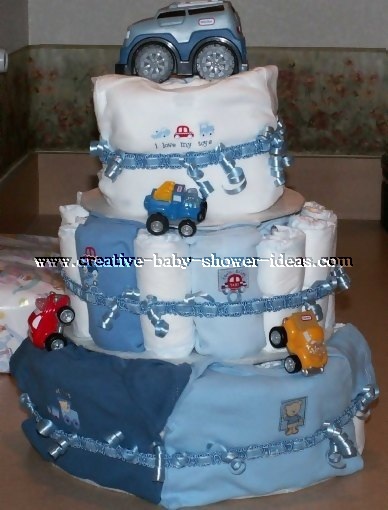 To enter the creativity with diapers contest, just submit your photos and ideas on our diaper cake website. Provide the ingredients used and a description of how you put your cake together. Click Here To Share Your Ideas and Enter The Contest! This is an on-going contest. As soon as one contest gets over, all new entries will be entered into the next contest. All entries and photos will become the property of creative-baby-shower-ideas.com.